I have discovered a mistake in my knitting and have to back-track several rows to make the correction. I am not a knitter who is comfortable taking out entire sections and then putting the stitches back on the needle. I prefer to take out a row at a time until I come to the mistake. With that said, within my pattern is a "knit one below" and my question is how to take it out when I come to it and retrieve the correct stitch? When I've tried to do it with past mistakes I end up with two loops and a lost stitch. Obviously, I'm doing something wrong. Any help you can be with my question would be greatly appreciated since I don't have anyone locally who can assist me. What I usually do (providing there are not too many rows to unpick) is to 'unknit' each stitch across each row. To do that I hold the knitting as if I was going to knit another row but instead of inserting the tip of the right-hand needle into the stitch on the needle I insert it into the loop(s) below the stitch on the needle and then lift it off the left hand needle. With a stitch pattern where you have knit into the stitch below, you will have two loops on the needle for each stitch you unpick. 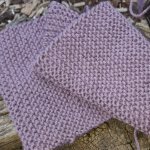 Assuming that your stitch pattern has a row of normal knitting on alternate rows, the extra loops will disappear when you unpick the next row. You just have to go slow and be a bit careful about what you are doing.